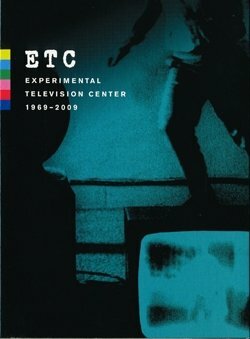 ETC: Experimental Television Center 1969-2009 is a compilation of groundbreaking electronic media work by 100 artists who have worked in the Center's Residency Program during the last 40 years. The collection offers a look at the evolution of the unique artist-designed sound and image tools that are the hallmark of the Center's studio and provides a view into the constantly changing artistic processes and practices that have shaped the work over the years. Video art began to develop in the late 1960s, with the introduction of the new portable video tools. While many artists used the technology to document and have voice in social and political issues, others collaborated with the technologists to design instruments that created imagery never before seen. ETC remains dedicated to the creation of video and digital instruments in the service of creative visual and sonic investigation by artists from around the world. Mara Alper, Amoeba Technology, Kristen Anchor, Benton Bainbridge, Irit Batsry, Bebe Beard, Alan Berliner, Kjell Bjørgeengen, David Blair, Peer Bode, Philip R. Bonner, Jean-Pierre Boyer, Lawrence Brose, Nancy Buchanan, Barbara Buckner, Torsten Zena Burns, Michael L. V. Butler, Abigail Child, Laurie Beth Clark, Charles Cohen, Connie Coleman, Dearraindrop, Andrew Deutsch, Kenneth Dominick, Monica Duncan, Nicholas Economos, ETC, David Fodel, Joshua Fried, Larry Gartel, Raymond Ghirardo, Jonathan Giles, Shalom Gorewitz, Carol Goss, Alexander Hahn, Barbara Hammer, Julie Harrison, Sachiko Hayashi, Janene Higgins, Gary Hill, Tali Hinkis, Sara Hornbacher, Takahiko Iimura, Kelly Jacobson, Deborah Johnson, Brian Kane, Peggy Kay, Zohar Kfir, Molly Kittle, John Knecht, Andrew Koontz, Richard Kostelanetz, Annie Langan, Kyle Lapidus, Brad Lemery, Paula Levine, Henry Linhart, Jeanne Liotta, Jason Livingston, LoVid, Kristin Lucas, Darrin Martin, Mimi Martin, Christina McPhee, Rohesia Hamilton Metcalfe, Aaron Miller, Bianca Bob Miller, Terry Mohre, Brian Moran, Ikue Mori, Nneng, Marisa Olson, Carol Parkinson, John Phillips, Michael Phillips, Alan Powell, Nicholas Ray, Megan Roberts, Ron Rocco, Peter Rose, Eric Ross, Mary Ross, Dave Ryan, Lynne Sachs, Eric Schefter, Michael Schell, Matthew Schlanger, Jessie Shefrin, Alan Sondheim, Caspar Stracke, Mark Street, Chad Strohmayer, Aldo Tambellini, Carolyn Tennant, Matthew Underwood, Liselot van der Heijden, Siebren Versteeg, Ben Vida, Nancy Walker, Reynold Weidenaar, Ann-Sargent Wooster, Walter Wright, Jud Yalkut, and Neil Zusman. Since 1971 the Center has offered programs in support of the media arts. Please visit www.experimentaltvcenter.org. All sound, video, and images copyright of the artists. c. 2009 Experimental Television Center Ltd.
- Roberts, Megan & Ghirardo, Raymond - Godzilla hey!